It is time to summarize 6th edition of Polish Championship in Software Testing. It is a great pleasure for us that this year you rated both the competition and your opponent, MrBuggy6, so high. Thank you for appreciating our work and commitment. Analyzing your opinions, we draw conclusions that it was one of the best competition in TestingCup history! You noticed that it was well-prepared technically. You also liked the idea that this year there was no internet access. We must admit that it was risky to make that decision. The more we are happy that it has met with your approval. It was really good to read all the nice words about our volunteers. You appreciated their involvement and enthusiasm. We are glad they were helpful for you. However, you pointed out that they should be better prepared for knowing MrBuggy6. Please remember that we always try to keep MrBuggy as a secret until the moment of the competition. But listening to your comments, we will try to find a compromise on this matter when organizing next Championship. You really liked it! Thank you! You even called it friendly ! You found it simple with interesting bugs and it was a pleasure to test it for you. You liked the idea of a built-in chat. We know that some of you had technical problems and we will work hard to avoid that next year. Do you want to know who created your opponent? At this point, we would like to thank very much development team of testerzy.pl: Michał Buczek and Paweł Piaskowy who created MrBuggy6. It’s thanks to them this year competition was so special! If you want to challenge MrBuggy (all six of them) please visit: mrbuggy.pl You will find there all the applications from previous editions as we place great emphasis on the educational side of TestingCup idea. 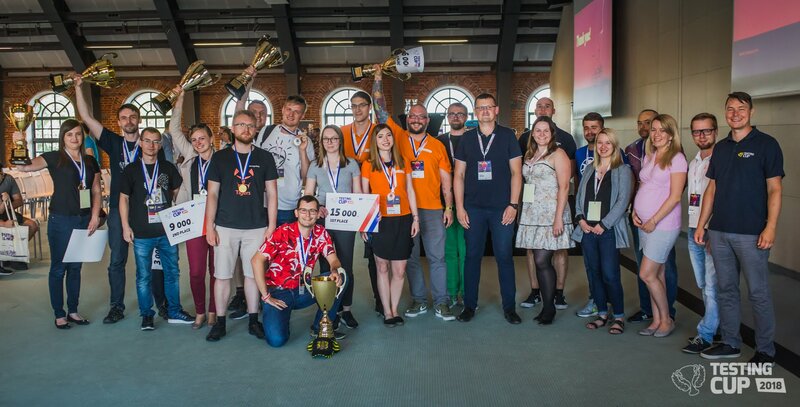 And here you can read (in Polish) how TestingCup 2018 is seen by its winner, Karol Gierszewski: https://blog.goyello.com/pl/2018/06/20/testingcup2018/. Thank you Karol for such a good feedback!